From the revisionist fairy tale author of Wicked and After Alice, a novel inspired by a timeless holiday legend, intertwining the story of the famous Nutcracker with the life of the mysterious toy maker named Drosselmeier who carves him. 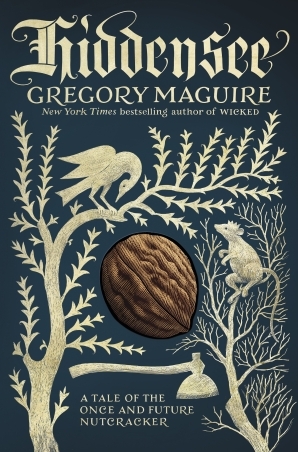 Maguire’s characteristic tone is dark and enchanting in his newest fairy tale revision. Into this origin story of the mysterious gift-giving Godfather in The Nutcracker he has woven many traditional Germanic tales and a few Hellenistic myths, as well, to create a powerful story of hope and redemption sure to delight his fans. ...there’s barely a nutshell of music or magic in Hiddensee. Maguire has a style glazed with a patina of Old World formality. Don’t look for the passion and color of Tchaikovsky here; this is a novel with its own palette of darker, woodland tones ... like Dirk, the novel feels suspended between realism and fantasy ... But this remains very much a study of a man who left the forest of fairy tales and never fully joined the world of getting and spending. Dirk doesn’t really belong anywhere, a condition that eventually causes him a certain amount of tightly repressed anguish. Maguire explores this theme most sensitively over Dirk’s long friendship with a gay musician ... Maguire suggests that we all pine for some vaguely recalled but tantalizing moment from childhood. Hiddensee functions, like much of the rest of Maguire’s work, almost as an anti-fairy tale. That is, rather than having a protagonist leave the real world for a place of enchantment, before returning, Hiddensee has its protagonist leave the world of enchantment for the real world ... As with most of Maguire’s work, Hiddensee has a certain coldness, a certain distance, which may make it a bit difficult for some readers. The actual Nutcracker, it should be noted, takes some time to appear, and if you are looking for the Nutcracker’s story—well, as I warned you up above, this probably isn’t it ... The queer subplot, however, is handled with compassion, and a gentle touch, as is the story of another character troubled by dreams and clinical depression, unable to find medical help. And Maguire’s comedy continues to shine through, even in a book examining many dark moments, in and out of the fairy tale forest. If you’ve liked any of Maguire’s previous novels, or The Nutcracker, or have an interest in German Romanticism, I think you’ll like this. What did you think of Hiddensee: A Tale of the Once and Future Nutcracker?